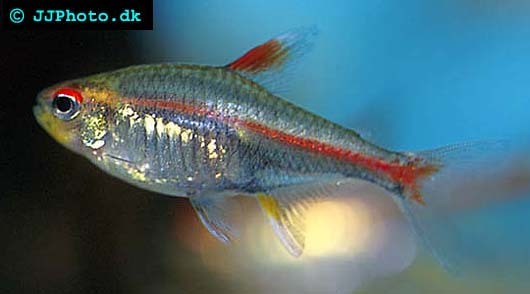 Company: Hemigrammus erythrozonus (Glowlight Tetra) are suitable for community aquariums. Aquarium setup: Hemigrammus erythrozonus (Glowlight Tetra) prefers an aquarium with dimmed lighting and dense vegetation. Leave some areas free to create areas to swim on. Hemigrammus erythrozonus (Glowlight Tetra) should never be kept in groups of less then 10 specimens. Feeding: Hemigrammus erythrozonus (Glowlight Tetra) accepts flake food. Breeding: Hemigrammus erythrozonus (Glowlight Tetra) is hard to breed although easier then many other tetra species. The fry hatches within 24 hours and are free swimming after 3-4 days. Feed the fry microworms and newly hatched brine shrimp.